One New Aftermarket Replacement Intake and Exhaust Manifold With Gaskets that fits John Deere 430, 440 SERIES. Over all height is 13 1/8. Exhaust flange mounting holes are on 3 1/2" centers, bolt holes are 1/2". Intake mounting holes are on 2 13/16 centers, bolt holes are 3/8. Top and bottom mounting holes are 6 center to center. HAS CORRECT JOGGLE IN EXHAUST. Replaces Part Numbers: T10369T MANIFOLD GASKET SET M3994T. Our processing system is automated. Thank you for your continued patronage. We carry parts for Engines, Transmissions, Front & Rear Axles, Hitch & Drawbars, Undercarriages, Final Drives, Seats, Bearings, Cups, Cones, Seals, Discs, Couplers, Gears, Brakes, Pressure Plates, Pilot & Throw Out Bearings, Ring & Pinions, Gaskets, Decals and MORE for most high wear items. We also carry replacement parts for the Boom Cylinder (Seal Kits, Tubes, Glands, Pistons, Rods). 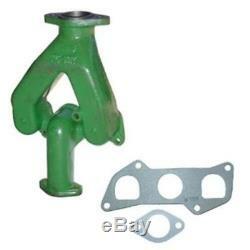 The item "T10369T Manifold with Gaskets Made To Fit John Deere Tractor 340 440" is in sale since Thursday, June 16, 2011. This item is in the category "Business & Industrial\Heavy Equipment Parts & Accs\Antique & Vintage Equip Parts". The seller is "reliableaftermarketpartsinc" and is located in Williamston, Michigan.